This naturalistic garden makes the most of a small area and links the contemporary home with the coastal bushland beyond. I have used light organic materials for paths and mulch to give a sense of space and continue the beach feel. Grey render and laser cut screens for the fencing make a restful, attractive back drop and the screens allow light and air to filter through the space. They also make interesting organic shadow patterns as the sun shines through. 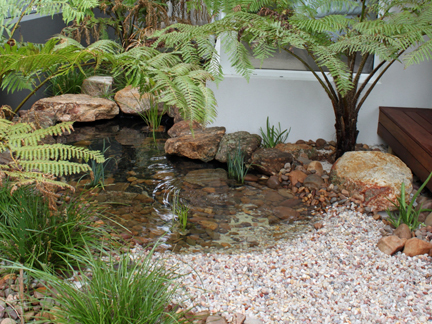 Rocks, riverstones and a simple shallow pond have been designed to look as natural as possible and to actually blend into the ‘path’. The elements of stone and water create a relaxing, grounded feel. Native plants give seasonal interest and character and will attract birds and insects. The owners love the garden and sit out on the deck to watch nature both within and beyond the garden.